Welcome! The lobby of the Deranged L.A. Crimes theater is open! Grab a bucket of popcorn, some Milk Duds and a Coke and find a seat. 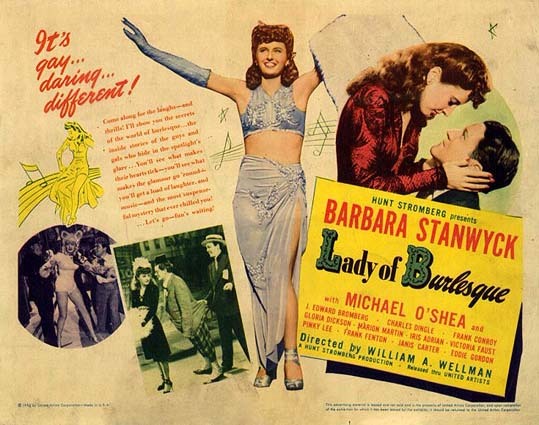 Tonight’s feature is the LADY OF BURLESQUE (aka THE G-STRING MURDERS) directed by William A. Wellman and starring Barbara Stanwyck and Michael O’Shea. 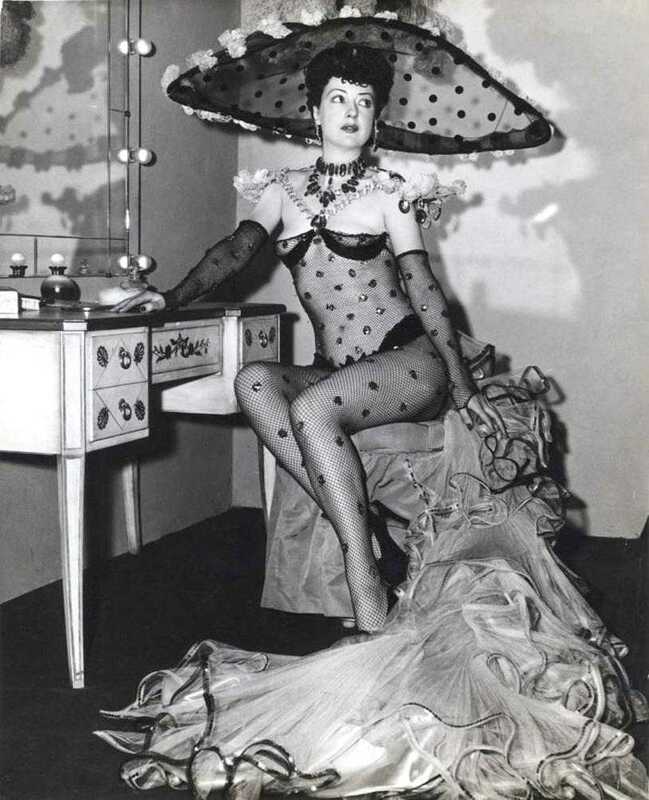 LADY OF BURLESQUE is based on the novel The G-String Murders written by strip tease queen Gypsy Rose Lee (with ghost-writing assistance from mystery writer Craig Rice). 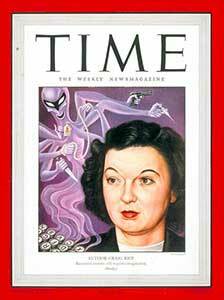 If you’re not familiar with Craig Rice, she wrote mystery novels and short stories, and is sometimes described as “the Dorothy Parker of detective fiction.” She was the first mystery writer to appear on the cover of Time Magazine, on January 28, 1946. Before we roll the feature, let’s enjoy one of Gypsy Rose Lee’s dance routines–followed by a clip from a Tex Avery cartoon starring the lecherous wolf character. S. B. Foss, owner of the Old Opera House on Broadway in New York City, promotes his new recruit, burlesque dancer Dixie Daisy, hoping that she will draw a large audience. Dixie’s performance draws cheers from the crowds and from comedian Biff Brannigan, who ardently admires Dixie even though she hates comics because of past experiences with them. When someone cuts the wire to the light backstage that signals the presence of the police, the performers are surprised by a raid, and pandemonium ensues. As Dixie flees through a coal chute, someone grabs her from behind and tries to strangle her, but her assailant escapes when a stagehand comes along. Welcome! The lobby of the Deranged L.A. Crimes theater is open. Grab a bucket of popcorn, some Milk Duds and a Coke and find a seat. Tonight’s offering is a “B” film from 1948 starring Michael O’Shea, Turhan Bey, and Evelyn Ankers. 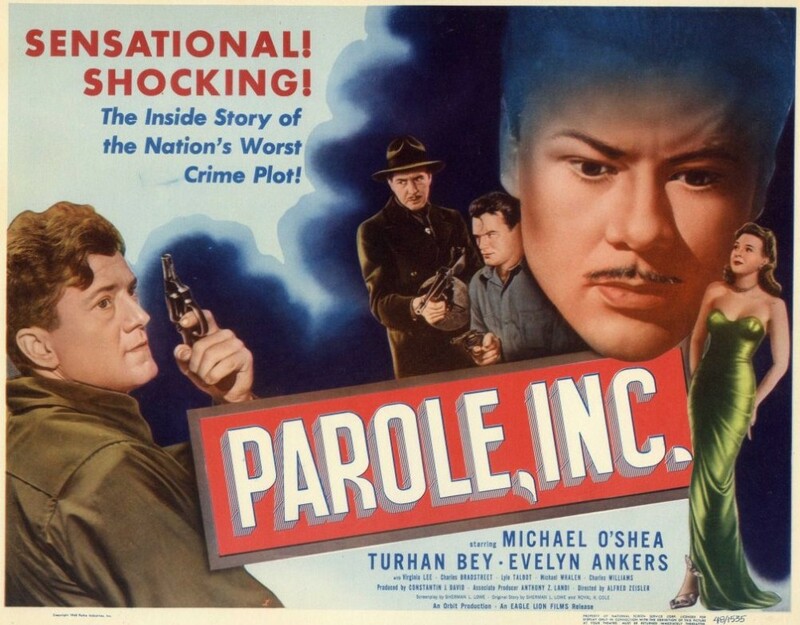 As federal agent Richard Hendricks lies badly hurt in a hospital, he dictates a full report for the bureau chief on his last assignment: Richard is hired by the governor, attorney general Whitmore and police commissioner Hughes to go undercover as parole violator Richard Murdock in order to expose a corrupt parole board.